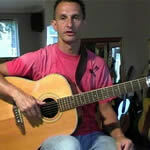 Learn to work out songs with this Guitar Tuition DVD. Ever heard a song that you wished you could play on guitar, but you can't find a TAB for it anywhere? Or even wanted to develop your hearing and knowledge of common song structures and chords? This DVD will help to give you a good understanding of how songs are formed, common chords, structures and keys used and how to identify them. The knowledge learned from this DVD can be useful not only for working out somebody else's song, but can also help you to get started on writing your own songs. One of the greatest tools in music is being able to understand music and how each part works with another to create the song in its entirety. Let this DVD help to broaden your knowledge.